For over 32 minutes, Syracuse and Boston College played a tightly contested game with the lead never ballooning to more than eight points at any time. The Orange (16-8, 7-4 ACC) would finish strong, closing a 13-2 burst with nine straight points to open up a 17-point lead and coast to a 70-56 road win. While SU scored on five of six possessions in that decisive span, including a pair of free throws and a lay-up off a flagrant one foul, the Eagles (9-14, 1-10) turned the ball over three times. Those miscues directly led to the final nine Syracuse points. The Orange dominated the glass in the second half, grabbing 16 of 24 possible rebounds after the break. While both teams committed 13 turnovers in the game, SU was much more effective at converting them into points, finishing with a 19-10 advantage in that category. Michael Gbinije and Kaleb Joseph powered Syracuse to a 49.1 percent shooting effort from the field by combining to make 15 of 18 field goal tries. The Orange won the opening tip and quickly took advantage, getting a Trevor Cooney three from the left wing and a Michael Gbinije steal that he turned into a finger roll in 45 seconds, forcing an Eagle timeout. The reset worked for the hosts as they scored the next eight points of the game. Kaleb Joseph hit a short pull-up to end the BC run, then Cooney buried a trey from the left side to boost SU back in front at 10-8. A three-pointer put Boston College back in front, then both teams went cold on offense for the next three minutes. Gbinije jumpstarted the Syracuse offense, ending the team’s dry spell by driving down the left side and finishing with a nifty reverse lay-up. 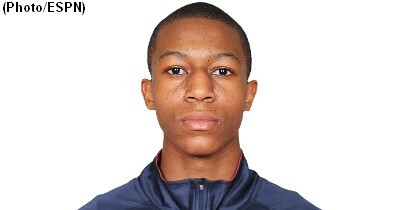 He converted a three-pointer from the right corner on a nice kickout from Joseph on the next possession, then hit B.J. Johnson in the left corner for a triple to make it an 8-0 Orange run with only 1:05 coming off the clock. The burst gave the Orange an 18-11 lead just before the midpoint of the first half. BC got a lay-up to end their scoreless streak at just over five minutes, but Gbinije fed Johnson for another three to nudge the Syracuse lead to eight points. After another Eagle score, Gbinije answered by absorbing contact in the lane and finishing with a lay-up to make it a 23-15 game with just under eight minutes on the clock. That would be the last SU score for just over six minutes. Fortunately for them, Boston College was unable to truly take advantage, getting only two sets of free throws and a jumper in that time, trimming the Orange lead to a deuce. Rakeem Christmas would finally get into the scoring column shortly after, finishing twice in the paint to boost Syracuse to a 28-24 halftime lead. The Eagles opened the second half with a triple to draw within a single point, but Joseph hit a short jumper to make it a three-point game, then knocked down a fadeaway to offset a pair of BC free throws. Gbinije banked in a Cooney miss to make it 34-29 in favor of the Orange. The Eagles scored in consecutive trips, including a three-ball, to tie the game, but Joseph hit another short jumper, then set up Gbinije in the right corner for a trey that reinstated the five-point SU lead. BC would again claw back within one point, but Christmas completed a three-point-play and Johnson stuck a corner three to bolster the Syracuse lead to 47-40. Shortly after that, the Orange got a pair of highlight jams. The first came from Gbinije, who hammered a two-hander in transition. On the next trip, Joseph used a Christmas screen to clear the lane, then took the elevator to the penthouse for an emphatic one-handed slam and a 54-46 lead. After a BC jumper and with under eight minutes on the clock, SU put the game in the cooler with a 13-2 run. Gbinije started the burst by cleaning up his own miss, then Cooney drained a pair of foul shots to push the margin to ten points. After an Eagle bucket, Christmas stole the ball and passed to Joseph for a 3-on-2 fast break. The middle of the key opened and Joseph again rose up, this time finishing with a two-handed dunk. On the next Syracuse trip, Johnson connected on yet another three. Joseph then came up with a loose ball and led Cooney with a long pass. Cooney gathered the pass and went up with the ball, drawing what would be ruled a flagrant one foul, giving him two charity shots and the Orange the ensuing possession. He turned that foul into four points, making both shots from the line, then scoring on a pretty lay-in after SU leaked out most of the shot clock. 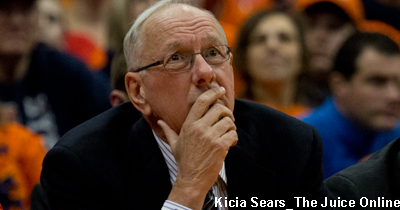 The basket gave Syracuse a 67-50 stranglehold on the game with 3:36 to play. Boston College scored the next four points, but Cooney added an exclamation point for SU, sticking a stepback three with under a minute on the clock and drawing a clearly audible “Let’s Go Orange” chant from the Syracuse fans in attendance. Michael Gbinije led all scorers with 21 points on 8-of-11 shooting and also had four steals. Each half of the starting Orange backcourt also reached double digits in scoring, as Trevor Cooney had 15 points and Kaleb Joseph added 14 on a perfect 7-for-7 shooting night. Joseph did most of his damage in the second half, scoring a dozen points in that session. B.J. Johnson contributed a dozen points off the bench via four three-pointers (on a dozen shots from deep). Rakeem Christmas had ten rebounds and three blocks to compliment his season-worst seven points, ending a streak of 20 consecutive double-digit scoring efforts. Aaron Brown paced Boston College with 19 points. Olivier Hanlan added 16 points. No other BC player had more than seven points. 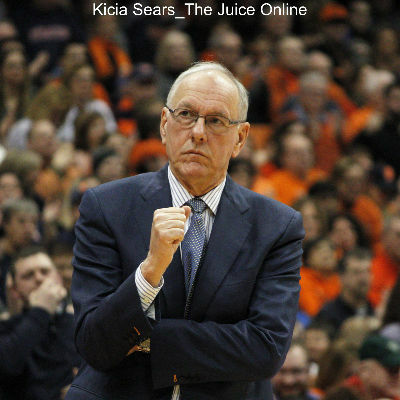 Valentine’s Day will bring new conference rival #5 Duke to the Carrier Dome. The Blue Devils (21-3, 8-3) have won four in a row and seven of their last eight. Freshman center Jahlil Okafor leads four Duke players who average double digits in scoring at 18.0 points per game and also snares a team-best 9.1 rebounds per outing. Quinn Cook, Justise Winslow, and Tyus Jones average over 37 points per game combined and have made 121 triples on the season on nearly 39 percent shooting from deep. The game will start at 6:00pm Eastern with ESPN televising the affair and streaming the game online at ESPN3.com.